A CSV file is a plain text file which stores spreadsheet or basic database-style information in a very simple format. 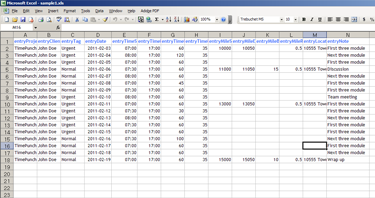 Most PC based spreadsheet program can create CSV file and we will use Microsoft Excel for this example. Go to Excel and open a spreadsheet. When saving file, make sure to save the spreadsheet as "csv" type. For this, use the "CSV (Comma delimited) (*.csv)" option in "Save as Type". Class Buddy cannot understand the default "xls" type. 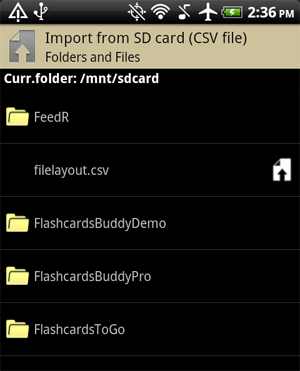 In import screen, you will see the list of folders and files in SD card. Folders have yellow folder icon in left, and CSV files has white import icon in right side. 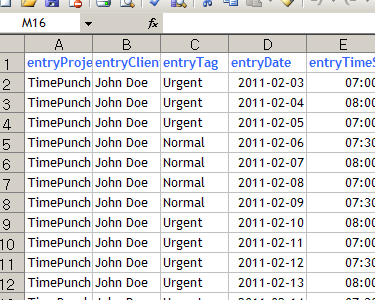 Select the CSV file you just created in Excel. Then you will see your entries. If your CSV file includes non-English characters such as Asian two-byte character, you may have display problem. This problem is mostly caused by the language-encoding difference between Windows Excel and Android OS. If you are familiar with encoding, you may solve the problem using third party notepad application such as NotePad++ or EditPlus. These programs can convert "ASCII" in Excel CSV to "UTF-8" which is used by android OS. 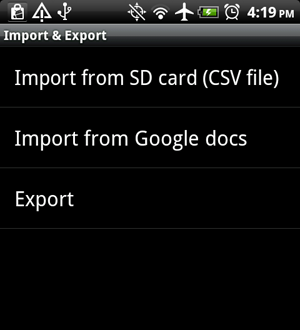 Otherwise, we recommend "Import from Google Docs" option instead of CSV import.